Wonderful card, Nightmare before Christmas is a firm favourite in our house. Thank you for joining in with us at Fab'n'Funky challenges. Your NOT Christmas card is fabulous NC, and it definitely brought a smile to my face. You did a wonderful job merging the different images to make a whole scene, and it's definitely Burton-esque. Thanks for sharing the story of Vincent, I didn't know he was a muse for all those brilliant stories. Well, that was quite the story! Having never seen "The Nightmare Before Christmas", I'll just have to take your word about it. Great job merging the different images together. Thanks for playing with The House That Stamps Built. Love the movie'The Nightmare Before Christmas' and loved your tale of Vincent. 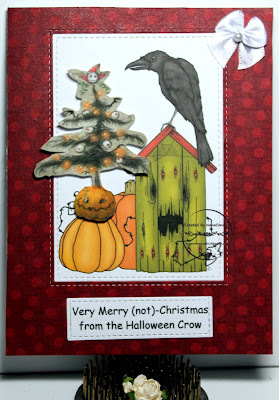 Great job on the image and your sentiment is perfect for the card. An intresting card, a film I've never seen. Thanks for joining us at The Paper Shelter this week.